This entry was posted in Award-Winning, Behavior, Children's Picturebook, Computer speak, Computers for Kids, Consideration for Others, Good Listening, Picture Book, Review, sherrill s. Cannon, Uncategorized on November 26, 2015 by Sherrill S. Cannon. “With Christmas right around the corner, it’s easy for the hustle and bustle of gift-giving to eclipse the true meaning of the holiday. 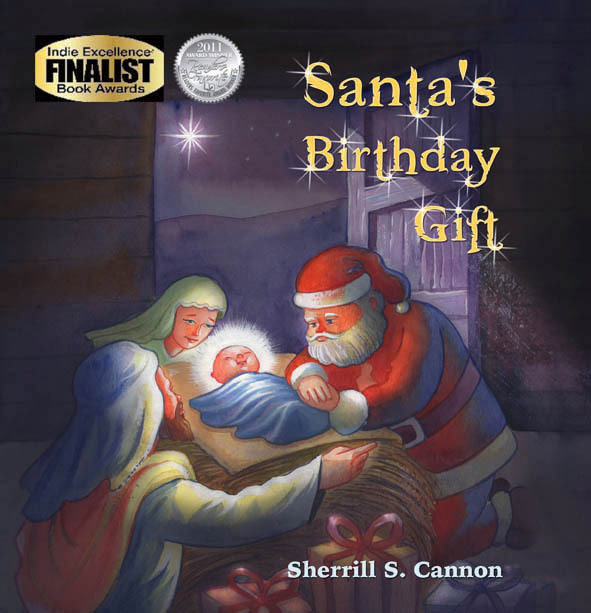 Author Sherrill S. Cannon provides a reminder in her children’s book about how Christmas can be about both Santa and Jesus. In “Santa’s Birthday Gift,” Cannon takes the story of the Nativity and puts into simple terms for a very young child to understand. In a unique twist, the story shifts to an angel named Santa who sees the star at the North Pole and realizes that God’s Love had been born as a child. At a time when Christmas has become increasingly more about Black Friday, Cyber Monday and gifts under the tree, “Santa’s Birthday Gift” grounds children and their parents alike, reminding them of the true meaning of the holiday. The story, which focuses on prayer and giving, simplifies the story of Christ’s birth without confusing children, and without leaving Santa out. With thousands of copies sold, “Santa’s Birthday Gift” is part of SBPRA’s robust and growing children’s book catalog. Cannon’s book is available for online purchase through Amazon, Barnes & Noble and SBPRA’s website. This entry was posted in Award-Winning, Children's Picturebook, Christmas, eBook, Picture Book, santa's birthday gift, SBPRA, sherrill s. Cannon, Uncategorized on November 17, 2015 by Sherrill S. Cannon. Thanks so much for this nice posting by Lou Belcher in the Florida Book News about the upcoming Meet the Authors Book Fair at the Eau Gallie Civic Center in Melbourne, Florida. The book fair is on November 21 and 22, 2015 from 9:30 AM to 4:30 PM. It is in conjunction with the ArtWorks Eau Gallie Fine Arts Festival and is free and open to the public. Mice and Spiders and Webs…Oh My! illustrates the importance of being a good listener. It also is a cute introduction to basic computer terms. Rosemary is worried about returning to school, after her teacher has warned the class that they would soon have some mice, spiders and webs in the classroom. Could Rosemary have misunderstood something? It has won a Readers’Favorite HM Award, as well as a Pinnacle Achievement Award. 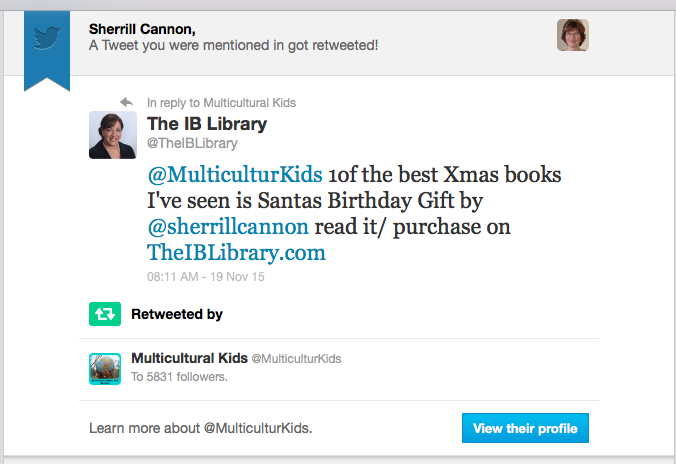 Sherrill S. Cannon is a former teacher and a grandmother of ten, who is also an Award-Winning Best-Selling Author. Her seven multi-cultural rhyming books have received thirty-six 2011-15 national and international awards. Most of her books are intended to teach something, like good manners and consideration for others. Cannon is also the author of seven published and internationally performed plays for elementary school children. She is a resident of New Hope, PA but will be participating in the Meet the Authors Book Fair at the Eau Gallie Civic Center in Melbourne Florida. The book fair is on November 21 and 22, 2015 from 9:30 AM to 4:30 PM. It is in conjunction with the ArtWorks Eau Gallie Fine Arts Festival and is free and open to the public. http://bit.ly/1GUdnI5 – Link to BN Mice & Spiders! This entry was posted in Award-Winning, Children's Picturebook, Computer speak, Computers for Kids, Good Listening, Picture Book, sherrill s. Cannon, Uncategorized on November 16, 2015 by Sherrill S. Cannon. I Love Getting eMails like this one! Mice and Spiders and Webs…Oh My! Please let me know if any more of you have any nice reactions to any of my books that you’d care to share…! 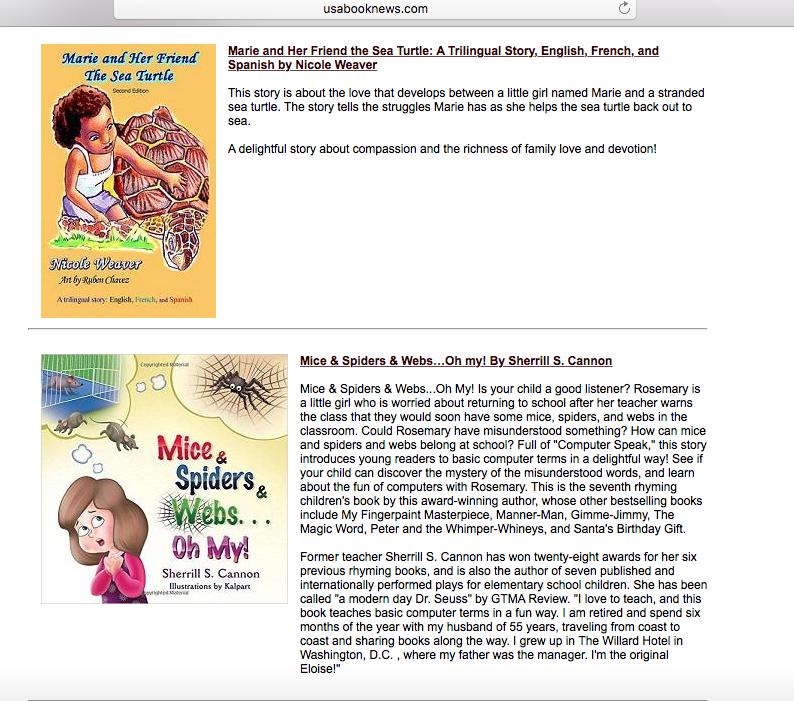 This entry was posted in Award-Winning, Behavior, Children's Picturebook, Computer speak, Computers for Kids, eBook, Fundraising, Good Listening, Picture Book, Reviews, SBPRA, sherrill s. Cannon, Uncategorized on November 14, 2015 by Sherrill S. Cannon. 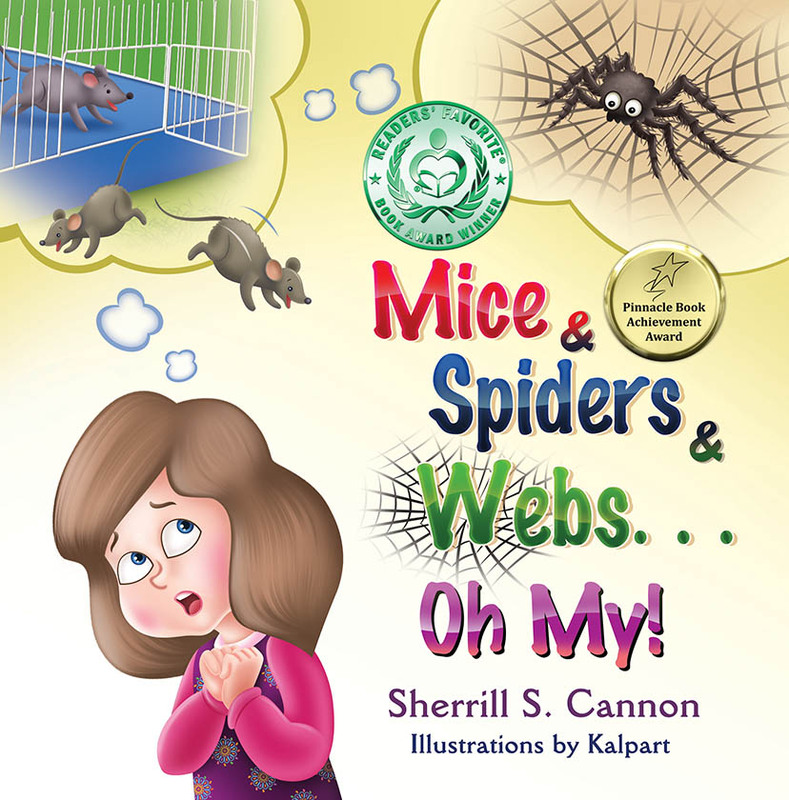 Beachbound Books Loves Mice and Spiders and Webs…Oh My! “Mice & Spiders & Webs … Oh My! is the humorous rhyming tale about a little girl and a big misunderstanding. Rosemary is very worried about going to school after her teachers latest announcement. It seems the class is going to be getting mice and spiders and the only ones effected by these scary critters are the females. Rosemary’s mom begins to think something sounds a little off and decides to speak with the teacher. Will they get to the bottom of the new class activity so Rosemary can return to school? Of course my favorite aspect of this charming story is the rhyme. This wonderfully versed tale will have children and parents giggling with delight. As most parents know little ones often misinterpret what we say and until we get to the bottom of their confusion they can become frustrated and worried, much like little Rosemary. I adored this fun story and know it will become a fast favorite among readers. This is also part of a Giveaway! So please go to the site and enter!!! This entry was posted in Award-Winning, Children's Picturebook, Computer speak, Computers for Kids, eBook, Picture Book, Review, Reviews, sherrill s. Cannon, Uncategorized on November 11, 2015 by Sherrill S. Cannon. Your book is currently listed live on USABookNews.com. Nice to be in excellent Award-Winning company! Nicole Weaver is an awesome author, and fellow winner in the Readers’ Favorites awards! 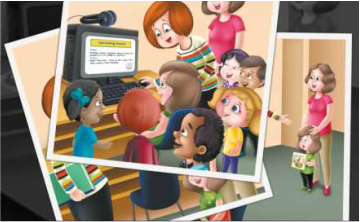 This entry was posted in Award-Winning, Children's Picturebook, Computer speak, Computers for Kids, eBook, Picture Book, SBPRA, sherrill s. Cannon, Uncategorized on November 7, 2015 by Sherrill S. Cannon.